Yet another standing ovation for Fox Network—after releasing the highly acclaimed The Trading Floor <東方華爾街> last summer, the renowned production company came back with the crime thriller Stained <心冤>, and it’s pushing all the right buttons. Stained, directed by Patrick Kong (葉念琛), stars Kara Hui (惠英紅) as Senior Inspector Po Fei-fung, who is on a vengeance spree to save her husband Chief Inspector Lau Wai-yi. Her husband, portrayed by Anthony Wong (黃秋生), is being accused of spying on the police force—a black cop. Tse Kwan-ho (謝君豪) stars as Kara’s superior, Chief Inspector Kei Tak-shing, but his motives are unclear. Even to the end of the final episodes, viewers were left sitting on the edges of their seat, wondering if Tse Kwan-ho ever had intentions to harm Kara. 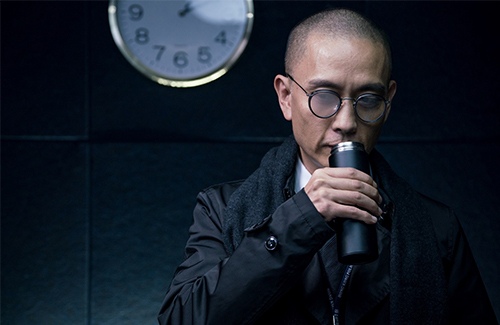 In the final episode, it was revealed that Yau Ho-lam, portrayed by J. Arie, was the true villain, but there is still one more final boss behind her—someone she likes to call “Baba,” or father. The true identity of Baba was never revealed, even at the end. According to director Patrick Kong, that was his intention. He wanted an unfinished ending, as the producers wanted to leave the ending open enough for a second season. Stained is not only Tse Kwan-ho’s first Hong Kong television drama in five years, it is also his first collaboration with Kara. Tse Kwan-ho and Kara’s very first scene together was in the first episode, when his character “Kei Sir” questions Kara’s “Madam Po” in the interrogation room. Madam Po welcomes Kei Sir with a powerful sitting stance, manipulating the power in the room. Two world class veterans at work…amazing! Didn’t know who is Tse Kwan Ho till i watched this drama. He’s super cool and awesome as Chief Inspector Kei, his cold stare is enough to give anyone the shivers. Love the fiery interaction he had with kara in this drama, definitely the highlight each time the 2 of them cross paths. The action scenes were fast paced, realistic and Kara sure can fight like a tiger even though she’s almost 60,. However the main storyline felt under developed and rushed and left me with a lot of unanswered questions regarding Anthony’s character (which curiously we never actually get to see his face). It would have been better if there were a few more episodes to develop the main story.